Again, this bit might only be interesting to some – if anyone – of you. But this is part of the ”bragging pages”, after all, and no one is forcing you to read this. So feel free to move on if you prefer, or stick around. 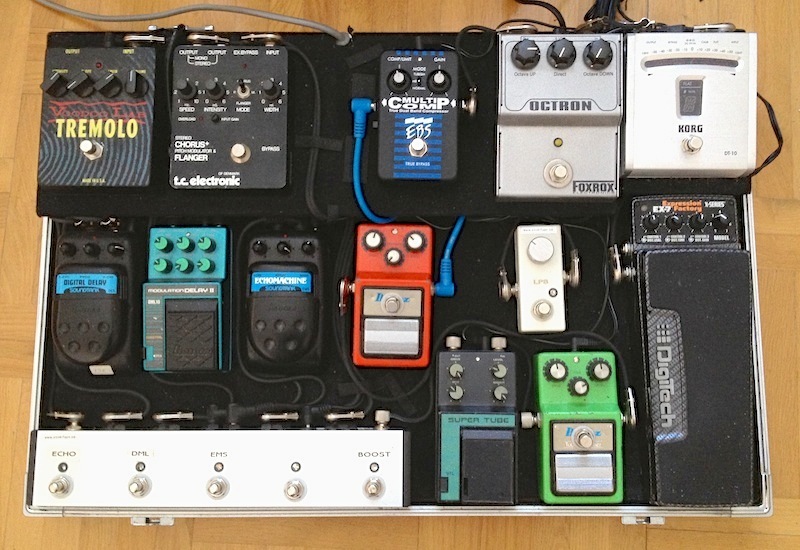 This will be a birds-eye view of the pedalboards as they stand, and will be periodically updated, as and when they change. For more info on the individual pedals – including the ones that currently doesn’t feature on any of my pedalboards – check out the different effects categories. 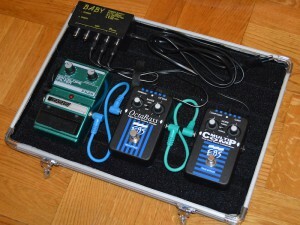 I used to keep two pedalboards – one big/main board and a small grab-n-go board for quick rehearsals and tight stages. As I started using the digital 11 Rack rig more and more, I found myself only bringing an amp/pedalboard rig when the gig was either too small to have a proper PA, or when I needed a quick rig for a rehearsal. So while I had all my favourite pedals on the large board, I realized was really only using the small board. So I ripped up both boards, and decided to start fresh with a new ”main” board, but confined to the smaller size. Tuner/input buffer – T-Rex Tunemaster. I used to have a Korg DT-10 (as shown in the pic) first in line, but decided to try the Tunemaster to save a little space. Sadly, the Tunemaster I have does leak a little DC voltage when in buffered mode (causing the other pedals to pop), so that needs to be fixed before it will work as intended. Either that, or I go back to the trusty old DT-10. Dirt – a Stinkfoot ”30” (Catalinbread CB30 circuit built on veroboard) for low gain tones, and a Mooer Solo for higher gain stuff. Boost – home built Micro Amp-style booster. The pedal used to have a nice chickenhead knob, but I’m currently trying a larger one to allow me to adjust it on the fly with my foot. Not as pretty, but function beats form. Modulation – Mooer Ensemble King chorus and a Mooer Eleclady flanger (for those Andy Summers moments). Delay – a Mooer Echolizer for standard echo, and the Ibanez DML10 has currently moved over for a TC Flashback Mini. Tremolo – Voodoo Lab Tremolo. Yes, it’s big for this type of board, but it sounds great and the volume control is invaluable. I have a Mooer Trelicopter that I also like very much, but you can’t set the level on that one. All powered by a Cioks Baby power supply. The MultiComp stays on pretty much 100% of the time. I originally had the Octabass last with FX25 in the middle, but found it tracked better when being fed directly from the compressor. The bonus is that the FX25 provides a consistent, fully buffered signal that has no problem driving even a passive DI box with the amp connected to to the parallel out jack. That can sometimes be a problem, with the two input impedances (of the DI circuit and the amp) ending up in parallel with each other. 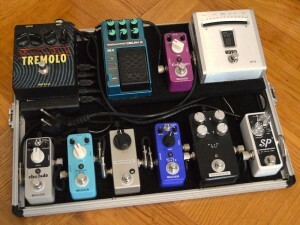 The whole board was powered from a Modtone Power Plant located underneath the back row riser. The EX-7 has its own power supply, while the TC Chorus is mains-powered. Both of those get their mains power from the accessory mains outlet on the back of the Power Plant, via a dual extension cable I whipped up. The Power Plant does have a 9vAC output, which should eliminate the need for the EX-7 power supply. But sadly, it creates a hum in the EX-7… 🙁 I am told they’ve fixed this in a later revision of the Power Plant, but mine is still the old one.